Monument of Mrs Henry (Ellen) Wood (1814-1887). The Times of 9 February 1889 reports that the monumental masons were Macdonald & Co. of Aberdeen; but the firm of A. MacDonald & Co. had a workshop in the Euston Road, so the work is likely to have been theirs, and done locally. 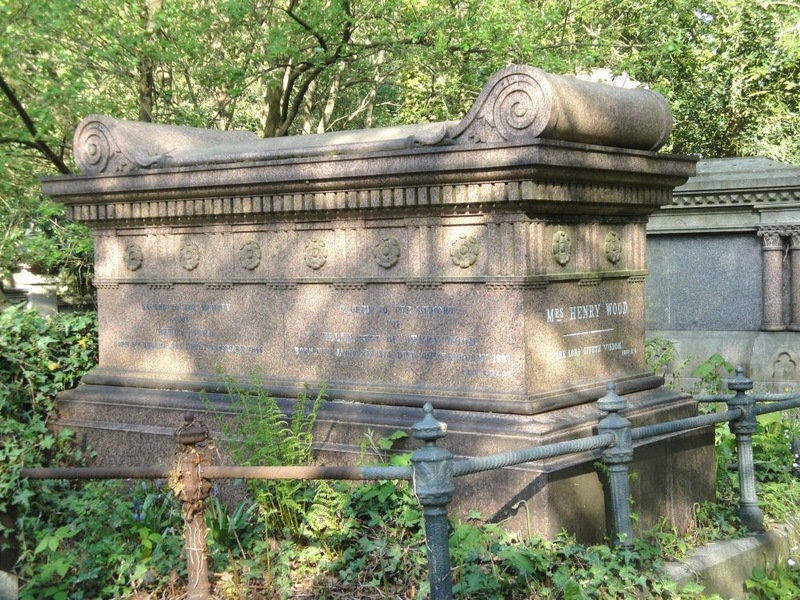 Completed early in 1889, the monument is of red Aberdeen granite, and is located in the Western Cemetery of Highgate cemetery, Swain's Lane, London N6. In the bright sunshine of yesterday forenoon, a procession which attracted general attention, and evoked much sympathy and manifestations of respect, passed by the northern boundary of Regent's Park, up the main road to Highgate Cemetery. The procession consisted of sixteen carriages, and its character was proclaimed by that which came first. This was an open funeral car, drawn by four black horses; and the polished oak coffin, with its massive brass mountings, was heaped up with fragrant wreaths of choice hot-house flowers, mostly snow-white, and set about with delicate ferns. These memorial offerings of sorrowing friends not only covered the coffin, but were piled up on either side to the lid, and hung upon the pinnacles of the hearse roof. Bystanders uncovered as this procession passed along, and the response to the oft-repeated questions whispered from house to pavement was always the same — "It is Mrs. Henry Wood, the novelist." "I never saw such a sight," said one working man to another, uncovering as the procession passed them. The tomb-chest monument itself was not completed until about two years later. In keeping with the appurtenances of the funeral, it is particularly fine. According to Mrs Wood's son and biographer, it was copied from that of Scipio Africanus (Wood 320), and that is what the Times reported when it was completed. But the original is more correctly described as the sarcophagus of Scipio Africanus's ancestor, Cornelius Lucius Scipio Barbaratus, which is preserved in the Vatican Museums (see Griffith 71). The choice of style might seem rather pretentious, but in fact this was fashionable at the time — the "Scipio" memorial was "the model for a great many nineteenth-century memorials in cemeteries on both sides of the Atlantic" (Curl 77). Supporting the latter point, illustrations in a book of memorial art published in America show similar tombs in several American graveyards, including Forest Home Cemetery, Milwaukee, and Swan Point Cemetery, Providence, Rhode Island. Indeed, says the American commentator, "It can safely be said that of all antique forms no other monument has been so frequently imitated. It is certainly one of the most dignified and beautiful of all the many forms used, requiring of the designer and sculptor a keen appreciation of what is graceful and in good taste, as well as in good proportion" (Griffith 72). The inscription on the end of the monument is "Mrs Henry Wood. The Lord giveth wisdom." Besides Wood's dutiful son Charles, who had been helping her edit the Argosy for several years now, the couple left two other sons and a daughter, and one or more grandchildren (see Mitchell). Curl, James Stevens. The Victorian Celebration of Death. Paperback ed. Stroud: Sutton, 2004. Print. 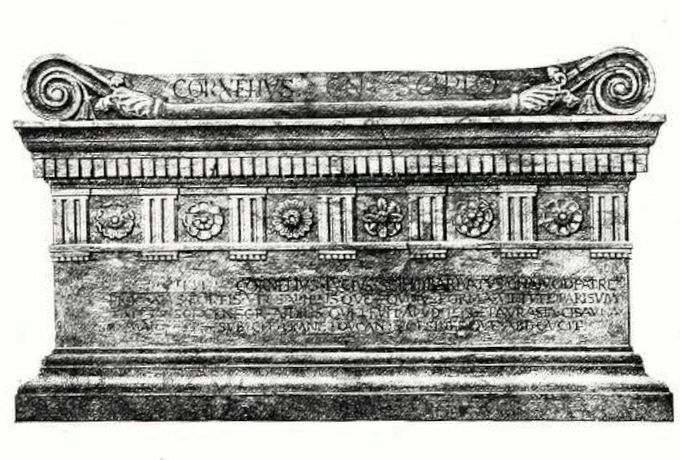 Griffith, A. H. "The Sarcophagus of Scipio." Memorial Art, Ancient and Modern. Arranged by Harry Augustus Bliss. Buffalo, N.Y.: Bliss, 1912. 71-74. Internet Archive. Web. 19 November 2013. "The Late Mrs Henry Wood — The funeral of." The Times. 17 February 1887: 10. Times Digital Archive. Web. 19 November 2013. "The Late Mrs Henry Wood — Messrs." The Times. 9 February 1889: 11. Times Digital Archive. Web. 19 November 2013. Mitchell, Sally. "Wood [née Price], Ellen [known as Mrs Henry Wood] (1814-1887)." Oxford Dictionary of National Biography. Online ed. "Mrs Henry Wood." Pall Mall Gazette. 11 February 1887: 3. 19th Century British Newspapers. Web. 19 November 2013. Wood, Charles W. Memorials of Mrs Henry Wood. London: Richard Bentley, 1894. Internet Archive. Web. 19 November 2013.